This paper is about one specific medical study of the position of the feet: that of the late Joseph M. Gambescia, M.D. 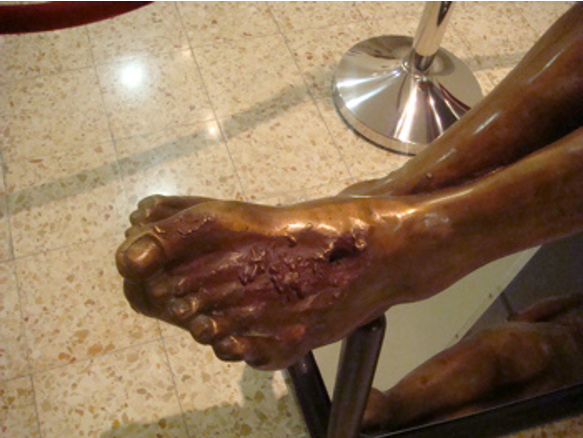 Two other previously published views about the stance of the feet on the Turin Shroud will be briefly reviewed. But this paper will be generally confined to what we may call a "third view". This investigation presents my own personal quest, in two parts, to seek an answer to the question: Which of the three views of the stance of the feet are most likely to be represented by the data on the Shroud of Turin? . . . Dr. Gambescia’s views have never before been published in any technical presentation. This will be the first.
. . . an important test of Dr. Gambescia’s proposal will be: Does it suggest answers to questions about intimate details in the blood markings of the Shroud that remained heretofore unexplained? This paper will briefly explore that. This one seems to be good, and I am looking forward towards it. I have been for a long time inclining that the traditional Barbet’s single nail through metatarsals of both feet is unlikely -for several reasons. I preferred two nails theories, but such combined approach may be interesting, as it may potentially explain all questions about feet position and bloodmarks.